UCA has a four -year predental curriculum that is designed to thoroughly prepare our students for the rigorous demands of dental school. Our students are very competitive when applying for dental program admissions – UCA graduates have been admitted to dental programs across the United States. 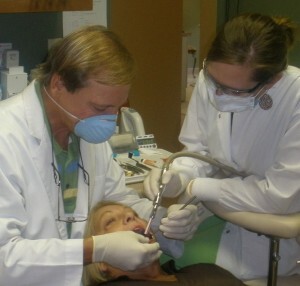 While predental students can major in any field of study, we find that most of our successful applicants are Biology or Chemistry majors, have excelled in their coursework (GPA above 3.8), have gained extensive clinical experience with local dental professionals, and have performed well (20 or higher) on the Dental Admissions Test (DAT). Predental students must possess a bachelors degree before they enter dental school (some have graduate degrees). Plan to earn your bachelors degree before starting dental school. BIOL 3410 Note that Biology majors can use one of the advanced biology courses in place of introduction to zoology. Two or more advanced biology courses such as anatomy and physiology (BIOL 2405; BIOL 2406 and 2407), physiology (BIOL 4460), microbiology (BIOL 3420), cell biology (BIOL 3402, BIOL 4475) and biochemistry (4320 and 4121) are recommended. For more information, please see Predental Student Guidelines UCA 2018.